Ernesto ‘Che’ Guevara de la Serna Lynch is the ultimate revolutionary. He is an icon that spawned a million t-shirts and whose assassination by CIA-backed troops in Bolivia in 1967 enshrined him as a martyr of the radical Left. 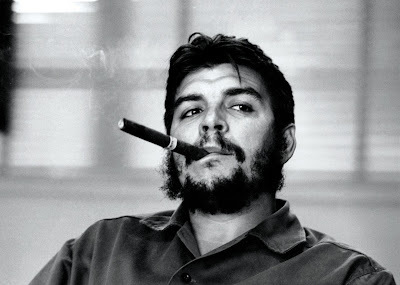 In his short life Che led revolutions in the Congo, Bolivia and – most famously – in Cuba. His life and passion has inspired millions and been celebrated in song, arts and film. As Fidel Castro remarked of Che, "rarely in history has one man's image, name and example spread so rapidly and so completely". Che Guevara has become one of history’s most fascinating and discussed figures. We have a great selection of Books About Che, Books By Che and Films About Che. You can also buy from our selection of iconic Che Guevara T-Shirts and get your own Che Guevara Mug. Che dedicated his life to fighting imperialism in defence of the world’s most vulnerable people. He believed that actions spoke louder than words. Join CSC today! Join the Cuba Solidarity Campaign – Che fought tirelessly to free Cuba from U.S. intervention and oppression. Over 50 years after the Revolution and Cuba is still isolated from the international community by an illegal U.S. blockade. The best way to oppose the blockade is to join the Cuba Solidarity Campaign. Please sign up online today and you’ll receive a free CD.